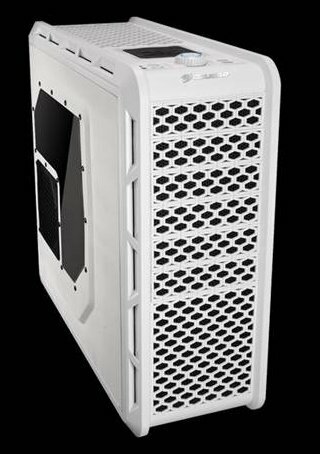 COUGAR, leading German PC case and power supply brand, added two more models to the award winning Evolution PC chassis series. For the past couple of years the prevailing color for PC cases has been black, but recently users are changing preferences and demand for a more diversified color spectrum. In particularly pure white coating is finding more and more friends among users. Therefore COUGAR has responded accordingly and is introducing the Evolution Galaxy case. In addition, with the Evolution BO, COUGAR is specifically catering to gamers who like a rugged look with the typical COUGAR style, by adding COUGAR orange colored design elements. Just as their black brother, the Evolution Galaxy and Evolution BO are full towers with a well arranged user interface offering 2 x USB 3.0, 2 x USB 2.0 connectors and HD-audio connectivity with one microphone and one headset/speaker connector. Most outstanding is the exclusive and eye-catching fan control knob with a dual-fan-set management. The Evolution BO sets itself apart by an even more exclusive color scheme. BO is representative of “Black & Orange”. While the main body is all coated in black, outside as well as inside, the mesh elements, drive fixation mechanisms and the drive trays are all orange colored. Different from the original Evolution and Evolution Galaxy versions, have a see-through window, the Evolution BO sports an orange metal mesh on the left side panel. On top of the COUGAR Evolution full tower chassis is a well arranged user interface with 2 x USB 3.0, 2 x USB 2.0 connectors and HD-audio connectivity with one microphone and one headset/speaker connector. But most outstanding is the exclusive and eye-catching fan control knob which allows for dual-fan-set management. Fans can now be arranged within two groups, e.g. one being placed around the VGA cards where ventilations needs might vary, while the rest of the case fans with less loading form a group of their own. With the newly available COUGAR Vortex series of PC case fans further ventilation upgrades are easily done as they also come entirely tool-less with fix pins for most convenient installation. Also included with all fans of the Vortex series are built-in anti-vibration pads to reduce noise caused by the potential transfer of vibrations. There are both 120mm and 140mm sizes with three different versions; standard Vortex with 3-pin and Hyper-Spin bearings, with 3-pin and Hydro-Dynamic Bearing and finally 4-pin PWM with Hydro-Dynamic Bearings. Setting these fans clearly apart from the crowd of available case fans on the market are the high-Vortex-Airflow innovative turbine blade that focuses the air-flow in order to optimize overall cooling efficiency in combination with the also patented frame that further helps to increase efficiency as well as operational silence. These are unique design characteristics making the difference. Also conveniently located on the top of the case is a hidden hot-swap docking station for 3.5” HDDs or 2.5 SSDs. This docking station is covered by a lid which provides protection against dust and even light water spills. The entirely screwless design makes upgrades and components exchanges as well as regular maintenance and cleaning a breeze, and an easy undertaking even for most novice users . The award winning COUGAR Evolution series got just better, by delivering offering color versions for all tastes, the classic black of the original Evolution, the COUGAR style black and orange version of the Evolution BO, and a pure white version in form of the Evolution Galaxy for gamers with a more exclusive taste. All models are now available for a suggested retail price of $94.99.